Coconut is a very important ingredient in Sri Lankan cooking. We use it in both our savory and sweet dishes. If you have never had a coconut in a savory dish, you don't know what you have been missing. 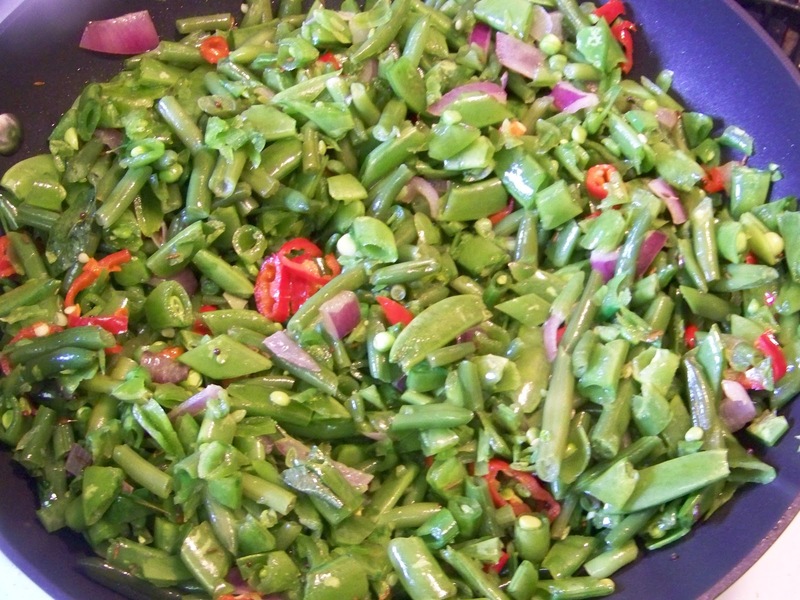 I bought a bag of fresh green beans for this dish, but you can use frozen or even canned if you prefer. This dish goes well with any rice and curry meal. Step 1: clean fresh beans or thaw frozen. If you use whole beans, cut them into small bite size slices. 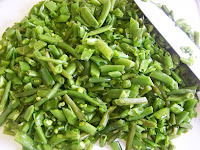 Another option is canned cut green beans. Step 1:In a large skillet, heat 1Tbs of canola oil on medium-high heat. Add the cumin seeds, mustard seeds and cinnamon stick, onions curry leaves, chilies. Fry 3-4 minutes. Next add the green beans and some salt to taste. If you are using fresh or frozen you will need to saute this for about 10-12 minutes (or until beans are to your desired texture). The frozen variety will thaw and give off a little water so you can "steam/fry" the beans. If they are fresh and dry add a little bit of water ( about 1Tbs) to make sure they beans don't get browned. If you are using canned beans just cook for 2-3 minutes. Next add the coconut, chili powder, turmeric. Fry for another 3-4 minutes. Taste for seasoning and finish the dish. Enjoy. I love coconut in my baked treats but never tried it in savory dishes. That has to change - maybe with this dish? It looks amazing! I just want to dig in right through the screen! YUM! Spicy is always welcome in my book! Hooooly cow - two of my favorite things in one curry - I had no idea they could go together! This goes on my to do list. 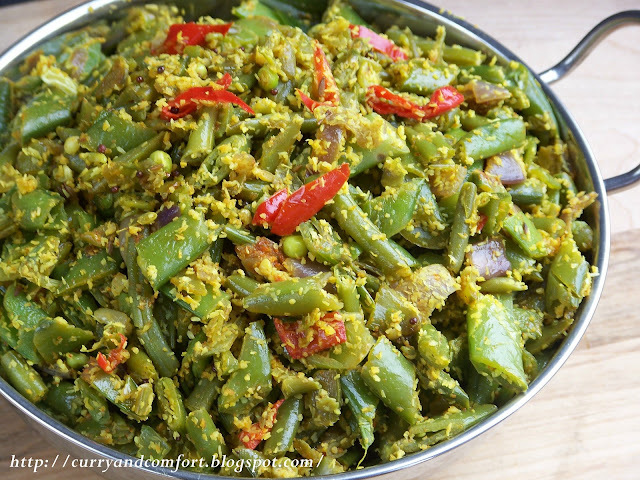 I love how the coconut is visually giving this dish texture--it looks absolutely delicious, and I love green beans in a curry. Yum, yum, yum! 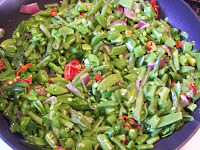 I love green beans and this is one I have to try. Actually Ramona you have introduced me to so many new dishes. You should see my list of ones to cook. Thanks again for doing the interview, it was great having you. I hope you have a very Happy Birthday tomorrow. We are so super cool for sharing a b-day hehe ;) Have fun! 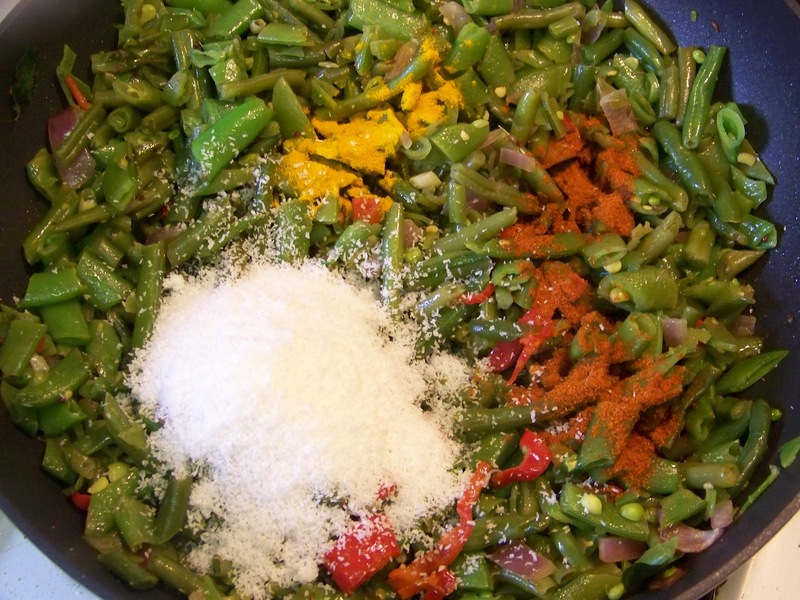 I've never made green beans with coconut before (first I'd have to track down some unsweetened coconut! ), but it looks wonderful!!! You know I love coconut! This looks so good! I love green beans too! Spicy greens, coconut, curry - by any chance have you read my mind on what I want for dinner tonight? 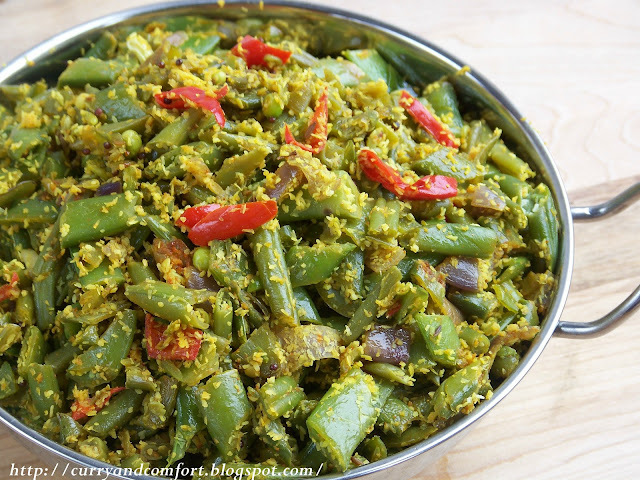 Healthy and super flavourful curry..wish to have with a bowl of rice. I've never used coconut in anything savory before - it's always been for desserts in my house! But I love the idea! This is such a cool recipe. I am such a coconut fiend. What an interesting combination of green beans and coconut! Another great curry recipe! 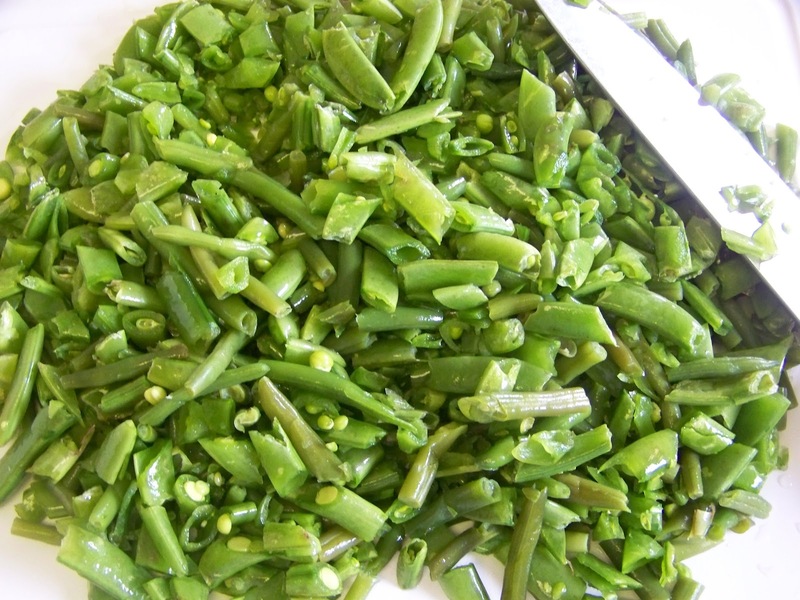 I have to admit I don't really love green beans, but I bet I could eat them up! 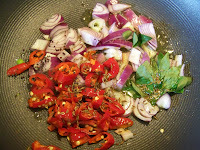 I found this recipe (and your lovely site) looking for a dish to go with a liver curry. This was very tasty and very quick to prepare! Thank you.